Greg Rosenberg, Rosenberg & Associates, presented ideas and challenges around land tenure for urban farming. 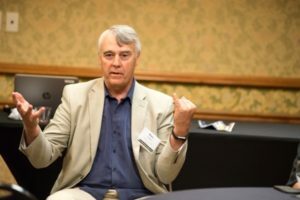 Dave Goeller, University of Nebraska, led a discussion on facilitating good transactions and how to build service provider skills to assist these transactions. Monica Rainge, Federation of Southern Cooperatives, spoke to a full house about socially disadvantaged groups dealing with land access and opportunities to overcome systemic prejudice. Aaron Clay, attorney, discussed the issues and implications around agricultural water use for land access and transfer. 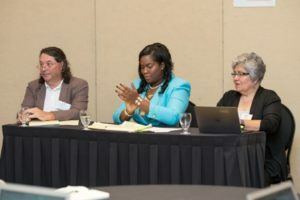 Cris Stainbrook, Indian Land Tenure Foundation, Monica Rainge, Federation of Southern Cooperatives, and Maria Moreira, World Farmers Inc, discussed land tenure barriers of the next generations of African American and Native American farmers. Jim Craig, Colorado AgrAbility, and Matt Mulder, Arcadia Foods, presented programs and services for land access for military veterans. “Focus on…” vital topics included urban land access, systemic prejudice in access to farmland, land dispossession, heir property, land and water rights, land access issues for military veterans, and more. These tracks covered a wide range of critical issues related to land access, tenure and transfer. Several sessions addressed historical and structural inequities in land access. Others focused on specific producer sectors including military veterans, African American and Native American farmers/ranchers and landowners, and urban farmers. Focused on the special practical and policy challenges around land access in urban settings. Presenters drew from research and recent projects. Navigating the “soft issues”–communications, goals & values–can make or break land access or transfer transactions. This session focused on building service provider skills to assist these transactions. Focused on the unique and shared challenges faced by socially disadvantaged groups dealing with land access. Discussants set the stage for lessons learned and opportunities to overcome systemic prejudice to foster land access and secure tenure. In some US regions, water rights are integral to land tenure. What are the issues and implications around agricultural water use for land access and transfer? Heir property and partition sales present barriers to successful transfer of land to the next generations of African American and Native American farmers and ranchers. What are the program and policy opportunities to address this long-standing issue? This session focused on the particular challenges faced by military Veterans accessing land for their farm or ranch operation. A deep dive for policy and research wonks and wannabes. This roundtable explored policy options and strategies for the next Farm Bill, state-level policy opportunities and research priorities. How can visions and models “outside the box” inform and inspire our collective efforts on equitable land access and transfer? This roundtable combined creative thinking, cutting edge, real-world examples and analysis. 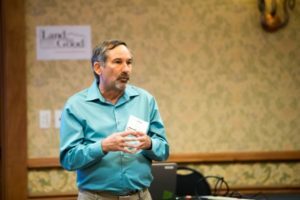 Farm advocates shared their case-based experiences and strategies that bring a social justice lens to land tenure work within a food system reform framework. 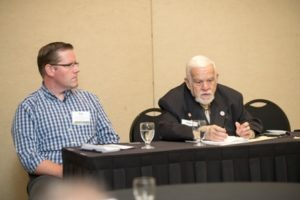 Ag industry representatives shared their positions and perspectives on land access and transfer issues faced by their constituency, and their thoughts on the political landscape to address agland tenure challenges. Import mechanisms used in other countries such as tax breaks for investment in community-owned land. Poudre Valley Community Farm: “community members own their local farm as a way of supporting it” (based on a mixed member cooperative structure). Terre de Liens acquires land with community investment; see link for other strategies. See also AccessToLand. Community land trusts acquire agricultural land and offer ground leases. See, for example, Berkshire Community Land Trust. Earthseed Land Coop (NC) pooled resources to buy and share land and housing. Includes farmers and non-farmers. Explore and promote veteran-to-veteran land transfers. Agrability delivers services to farmers, ranchers and other agricultural workers with disabilities. Their land needs might be specific such as accessibility. 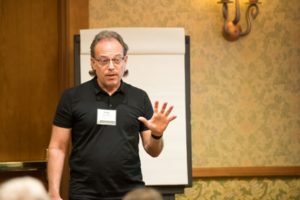 Will-writing workshops (Federation of Southern Cooperatives). Regional Heirs Property Coalition aims to assist families to retain their land and reduce heirs’ property land loss. Access to credit for heirs’ property owners: not able to get a loan without title, but eligibility could be based on an owner’s interest-share in the land. This makes the property/wealth/asset available to the owners. 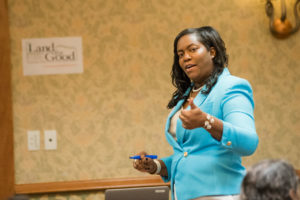 Education for service providers around issues and programs for farmers/ranchers, farmworkers and landowners of color, including understanding of different modalities that may be less familiar to funders and program managers. Have service providers accompany people of color to USDA offices. Address the challenge of requiring collective agreement in negotiating indigenous land access. Honor treaties and address reparations with indigenous communities. Strengthen solidarity and common interests among land justice initiatives in US and globally. Importance of land trusts taking water rights into account; flexibility in how water is managed in easements (e.g., placement of easement relative to a ditch, and to ensure rights are not permanently sold but may allow leasing). Farmer/rancher-friendly water use practices. For example, Interruptible Supply Contract and Reservoir Storage Banking. Colorado Open Lands: focus on water rights along with land access. Acequia Association (NM) for small producers/landholders system of water rights based on shared scarcity. The Lower Arkansas Valley Super Ditch Company provides leased agricultural water to cities; also pools funding for legal resources to address water pressure from Colorado’s Front Range. “Central Server” model in which a central organization does the heavy lifting for urban ag plots. Owns [or leases?] the land. Urban growers need orgs with specialized expertise to negotiate with city officials and city rules. Connect with urban affordable housing groups. Lease land on public housing property. Southside Community Land Trust does this, but currently limited to community gardens, not commercial ag. Land banks that make their plots available for farming. See for example, Kansas City, MO, Lansing, MI. Develop a national policy on agricultural land similar to that on housing, transportation, energy. Establish a Land Tenure Commission as recommended by the USDA Advisory Committee on Beginning Farmers and Ranchers (ACBFR) land tenure subcommittee. Include military veterans as eligible participants in the Conservation Reserve Program (CRP) Transitions Incentives Program. Adopt comprehensive state-level heirs’ property legislation to support heirs’ property owners. Establish a federal capital gains exclusion on certain farm/ranch transfers. Expand FSA loan eligibility to allow BFRs to buy into an operation; acknowledge challenges including placing operation at higher risk. Offer federal block grants to states to fund technical assistance for farm viability and succession planning. (Some states do fund this.) Option: as new part of BFRDP; target heir property/fractionation. Explore state and local tax programs, e.g., conflict between local property tax relief and state income tax relief as incentives to lease or sell land. Increase funding for USDA’s ACEP-ALE program; add affordability mechanisms; authorize buy-protect-sell for land trusts. Create FSA Debt for Working Lands Program to allow a borrower to write down debt on farm loan in exchange for an easement (similar to FSA’s Debt for Nature program).